Mad Head Games presents the newest addition to the Dark Realm series! 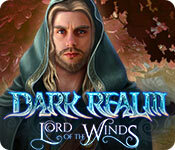 Dark Realm: Lord of the Winds is rated 3.9 out of 5 by 11. Rated 5 out of 5 by Alenee from Best of the series In this game, you play Queen Valera who has to save her friend and loyal servant (with benefits?) who has been caught in a power struggle between the Wind Kingdom and a hidden foe. This places him in mortal danger and he winds up being abducted (what else is new?). 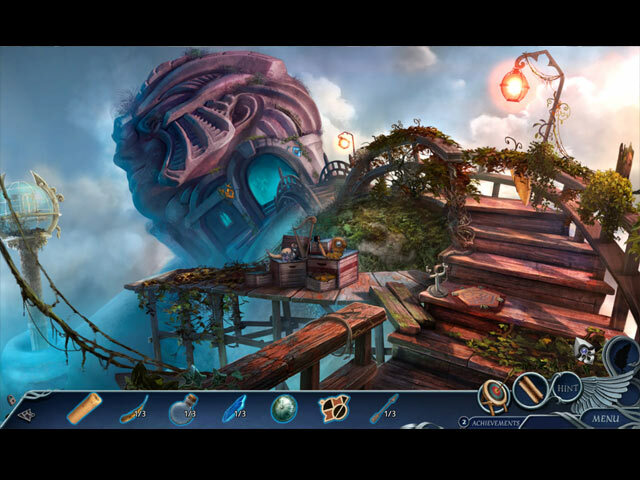 On paper the concept may not seem exactly fresh, but the plot twists and build up are very well done, with the mini-games and hidden object scenes integrated seamlessly into the action. As a bonus, the minigames have taken the old standby's and raised the bar to make them just a wee bit more challenging for regular Mad Head fans. I only gave the story a 4 star rating but if it had been just a bit more unique, I'd have sprung for a 5 without hesitation. As far as the scenery and gameplay go, this is the smoothest and most bittersweet, dramatic Dark Realm to date - it really feels like you're playing through a well written fantasy novel. That makes it better than the first two in my honest opinion. Play it and see if you agree! Rated 5 out of 5 by darcie77 from Mad Head does it again!! I love this game series by Mad Head. The graphics, ho's etc I hope they come out with more games soon. Really enjoy playing these games. Rated 5 out of 5 by Calla429 from Great game This game was well worth the money. I loved it. Great graphics and sound. Smooth cursor moves. Puzzles were easy to medium in difficulty. The story line made sense. Overall, a great game as are all of the Dark Realm games I've played. Rated 5 out of 5 by biscuitsmama from QUEEN VALERA IS BACK AND ON A NEW ADVENTURE Your home is in flames and invaded by banshee fire warriors intent on destruction. As you flee your father’s shop, you become aware that you may have some special powers, and you will need them to do battle with the evil that has overcome your village. Not only is your home in ruins but your father has been captured, and as you follow to see where he has been taken a friend comes to your aid and urges you to go to your grandfather’s home for safety, and this is where your adventure truly begins. There are four modes of gameplay to choose – Spark, Flame and Blaze along with the Custom mode where we can change the settings to suit the way we like to play. The graphics are excellent and crisp particularly in the 3-D cut scenes. The epic soundtrack is awesome and perfectly creates a sense of excitement at the beginning of the game and sets the tone throughout as we play. The voiceovers are also extremely good and they are lip-synced, which adds that extra touch of reality to the game. Very early in the game you will find some interesting tools – your mother’s medallion as well as her boots and it isn’t long before you discover that you will need to use these special tools to escape the watchful eyes of the invaders. The game has the standard other tools that we generally find in these games such as your journal and an interactive transporter type map that indicates where you have something to do (provided you haven’t turned that option off depending on the mode of play you selected). There are various types of interactive HOPs, some are the standard list type and others (far too many for my liking) are the story type where you will find items to use according to the tale. I happen to be most fond of the old-style list type HOPs that include some interaction but I know that many of you will really like the story type HOPs. On the other hand, I really like the excellent puzzles that are quite different from the ones that we see time and time again. Throughout the game there are collectible flames to find as well as morphing objects. There are, of course, the gameplay based achievements that are earned as you move through the adventure. IMHO, there are quite a few extras in the CE version of the game but most of them are locked until the game is completed, so it is a matter of personal choice of whether or not you choose the CE over the SE version that will be released later. Overall, I really enjoy this game. The graphics are excellent as are the voiceovers. Aside from the HOPs, the storyline, puzzles and gameplay are so entertaining that they blend together to create a top-notch game. I love this game and for me it is an instant purchase but, as always, I recommend that you at least try the demo to see if this is a game you will like. Rated 4 out of 5 by thebubba from Hooked from the opening. Loved the steam punk aspect. An air ship with a wonderfully rendered Captain to take you off to a huge adventure. And quite an adventure it is. 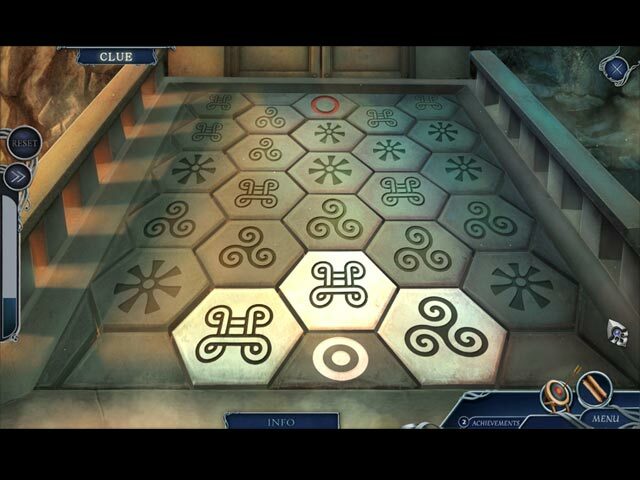 The puzzles are often very clever and sometimes a bit difficult and the HO's vary so you never lose interest. My favorite HO/puzzle involved tiny ancient symbols on a ships wheel that when clicked on properly would guide the air ship to its destination. Very original. This is one of the few games I never tired of. Big fun. A four and a half for sure. Rated 4 out of 5 by kdblueey from DARN, THOSE CREATURES (?) ARE HUGE! RUN FOR YOUR LIFE!! BASED ON COMPLETION OF DEMO: This is not one of my typical type games that I usually like or even play, but I wanted to try it out, just the same. Here are my pros and cons: PROS: 1. Great graphics. Colors fit each scene appropriately (withholding pastels, as this is definitely not a fantasy/fairy-tale game). 2. Good voiceovers with lip movement that fit the voice as well. 3. Music was good, although there was one particular scene where the music seemed more upbeat that didn't quite fit what was happening. 4. The storyline was good, although I haven't played any previous games from this series. 5. Interesting and challenging puzzles that weren't overwhelmingly hard or difficult, but seemed 'just right', IMO. 6. HOS's that were fun to play that offered a mixed bag of what all of us seasoned gamers are use to playing, but like them, nonetheless. CONS: 1. The different 'magical' arrows that were in this game, didn't seem to function as I think they should. I had some difficulty aiming or just getting them to hit the appropriate target. But then again, it was probably just ME, as I've never personally, shot an arrow at anything in my life before this :) 2. The demo ended way too soon. I wanted to go on and on just to see what was going to happen next. All in all, give this game a try, even for those of you who don't particularly 'like' this type of genre (as myself feel). You might be surprised and find out that you might just like it. Rated 4 out of 5 by pennmom36 from Let There Be Peace I love Mad Head games, you can always count on them to offer unique games that are highly entertaining such as, Cadenza, Shadowplay, Nevertales, Beyond, Shiver, Rite of Passage, Sable Maze, Witches Legacy, Where Angels Cry, Dark Realm, Haunted Hotel, Dark Dimensions, House of 1000 Doors, Empress of the Deep, Twisted Lands, The Secret Order, or Maze Subject 360, just to name a few. These devs clearly put a lot of time and effort into their games and Dark Realm: Lord of the Winds is a perfect example. The game gets way better after the demo, and the locations have gorgeous graphics. Clearly this is a fantasy based game, and the graphics reflect that very well. In my last few reviews, I talked about how lame some of the games from the well known producers have been lately. In my opinion they are releasing games at a wicked fast pace and seemingly not caring about the quality of entertainment the games provide. I've also stated that some of the "lesser known" series devs are ramping up their game as they try to compete with the big dogs, and they are producing some really good games that are highly entertaining. Dark Realm: Lord of the Winds by Mad Head games, reflects EXACTLY what I've been saying, quality through and through! Is this game perfect? No, there's always room for improvement, but it is very entertaining, has really good graphics, and offers a variety of HOP's and Mini Games. Nuff said, on with my review: Queen Valera has made a very important decision, one that could endanger the entire Kingdom and it's peaceful citizens. Queen Valera has offered a Peace Treaty with it's long time rivaling neighbor kingdom ruled by the ever so handsome King Harlon. She knows how dangerous it is, but she must lower the protective shield to allow King Harlon to enter so the treaty can be signed. King Harlon offers Queen Valera a gift, but as soon as she opens the chest, a powerful force attacks the Queen, taking her breath away, literally, removing her life force! Both sides panic, both sides begin blaming each other, but the Queen is dying! Queen Valera's best friend and right hand man, Nathaniel, offers to exchange places with the Queen, giving her his breath, so she may live, and save the Kingdom. A local healer is able to exchange the curse, and slow down the process on Nathaniel to buy some time, until the cure can be found. Queen Valera must travel to the Wind Colossus, to reverse the affects of this powerful orb, to save not only Nathaniel, but hopefully, stop the war between the two Kingdoms and establish peace going forward! Nathaniel has given the Queen his Bow, this is no ordinary Bow, this Bow has unlimited and powerful abilities. The first of many Arrows you have, allows you to retrieve anything the arrow hits. The Arrow will return along with the item that the arrow hit, but of course, there's a Mini Game involved with each use. Each time you use the Bow, you will play a variation of "Blocks" where you move blocks until the arrow has a clear path, each game becomes increasingly more difficult to solve as more blocks are added to the board. Eventually, you will find other arrows that have special abilities, an Arrow that has explosives, and one that freezes it's target, others are added after the demo. In the Collector's Edition the bonus features include 35 Hidden Feathers, one in each scene, Achievements to earn and a Morphing Object in each Hidden Object Scene. 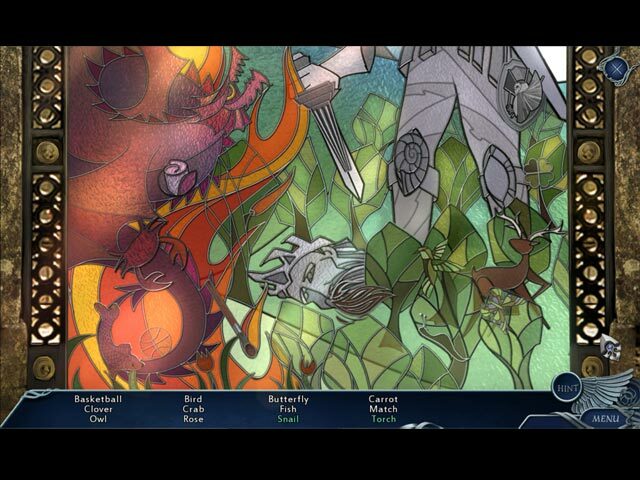 The Hidden Object Scenes are fairly entertaining, which Mad Head is well known for. They have very interesting scenes with Silhouetted Shape finds, Interactive List finds, and even Keywords or Symbol find during a story. One of my favorite scenes is finding shapes that are carved on the Ship's Wheel, turning clockwise or counterclockwise to steer the ship by finding the symbols shown in the center, one at a time. Another among my favorites was finding two different symbols that when combined would create the symbols from the inventory bar, The Mini Games are also entertaining, not to easy, but not too difficult either. Below are brief descriptions of some of the games you'll encounter during the demo, and a few notable puzzles from the main game: 1) The Bow and Arrow game of Blocks requiring you to move blocks until the arrow has a straight path to travel from the bottom to the top. 2) Select and rotate the blue rings to create a continuous line for the energy to flow through. Selecting one ring may affect the others. 3) Move sliders to aim the cannon both up and down and left and right, that select the fire bottom to shoot. 4) Find and fill in the shapes indicated on the pillars with corresponding colors. Select the stone shapes to enable or block flow of color. Fill shapes with color by pressing gems. 5) Guide the light through the maze by selecting empty highlighted circles to move the beam of light. 6) Select and guide the ball through the maze without touching the path walls. 7) Find three of each shape hidden within the illustrations of a storybook. 8) Reorder the fish from biggest to smallest by swapping the fish located on the top. You will need to follow the tangled lines to figure out where each fish will land at the bottom. 9) Fill the spiral with the three types of water by selecting from the puddles. No two touching fields can be the same. The Collector's Edition has 14 Concept Art pictures, 4 Wallpapers, 10 Music Soundtracks, 17 replayable Hidden Object Scenes to earn Gold, Silver or Bronze time awards, Collectible Hunt games, Constellations Mini Games, 14 Achievements, 35 Hidden Collectible Feathers, Morphing Objects within the Hidden Object Scenes, a built in Strategy Guide and a Bonus Chapter, enjoy! Rated 2 out of 5 by KITTYKAT360 from Thank goodness it was free I bought this one based on the reviews and I am so glad I used my free game code for it. The story line was odd with a mix of robot-like things fighting yet the characters used magic and arrows. Sorry, I just didn't get it. The puzzles were not enjoyable and barely any HOG throughout the game. I ended up skipping most of the puzzles as they were boring. (On the positive side, thank goodness the game allowed you to skip them!) This was one I struggled to finished and couldn't wait until it ended. Try it before you buy it.